Milk of Magnesia (magnesium hydroxide) is commonly used as a laxative or an antacid. The effect is a dosage dependent. It is sold in form of capsules, liquids and chewable tablets as a medicinal aid for constipation or a heartburn. Taken in a dosage as a laxative (2-5 grams), the osmotic function draws fluids from body to intestine, which stimulates the nerves within the colon wall. This promotes peristalsis and therefore the movement of colonic contents. In lesser doses (0.5–1.5 grams), Milk of Magnesia is used as antacid medication, neutralizing hydrochloric acid produced by the stomach parietal cells. Due to the formulation, only a fraction of the magnesium is absorbed by the body. The rest is excreted by the kidneys via urine. 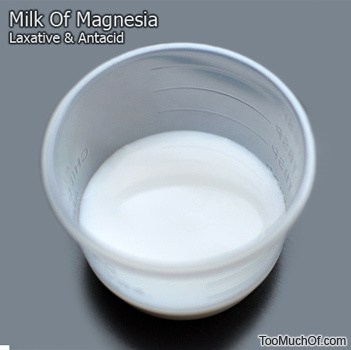 Although Milk of Magnesia is an effective constipation and heartburn remedy that acts seemingly more gentle and natural then other drugs that promote active intestinal peristalsis, frequent or long term use of Milk of Magnesia can lead to serious health complications. Generally, supplemental magnesium is not recommended to individuals over 60 years old due to a slow renal function which can cause a stress to the kidneys functions. The maximum recommended magnesium dose for people over 50 years is 300 milligrams per day, and ultimately come from food sources. Although magnesium supplementation is promoted by many naturopaths as healthy and essential, many people get enough magnesium from diets. Taking additional magnesium in form of supplements for insomnia, muscle pain, anxiety and neurological disorders may alleviate some symptoms. However, it can potentially be causing damages to other body functions. Without appropriate mineral balance testing, taking magnesium is not advised. Furthermore, since magnesium interacts with many medications, consult your doctor first before taking any magnesium supplements. If constipation is frequently an issue for you, one of the best natural remedies for it is Ginger Tea. Sipping a little ginger tea before and immediately after meals will quickly alleviate any existing constipation issues.